Campsie Minerva moved through to the second round of the JB Tyres M & M Trophy with a 3-1 away win over Stirling City on Saturday. Despite missing key players, Minerva continued their good form in this season’s cup competitions against a Stirling side unbeaten in the league and hoping to win promotion to the Premier League next season. Liam McLean came close to giving Minerva an earlynlead when his fifth-minute 20-yard shot skimmed the post with the keeper beaten all ends up. In midfield Jamie Pollock was coming up trumps with all the meaty challenges and giving Mikey Boyle up front plenty of the ball and the Minerva frontman was unlucky in the 15th minute to be thwarted by the alert Stirling keeper. But Minerva didn’t panic, stuck to their game plan and levelled five minutes later when Boyle was taken out 25 yards from goal and McLean powered his free-kick strike into the corner of the net. Minerva continued to dominate but although McLean went close another twice they couldn’t add to their tally before the break. Stirling still looked dangerous and keeper McCallum kept Minerva level in the 40th minute with a good stop, his good form in the last few weeks confirming why he has in the past been called up to the Scotland International squad. The second half was more contested than the first with Stirling upping the ante possession wise but with no real threat on goal. And on the hour McLean stepped up once again to put Minerva in front, taking a good through ball from Boyle 20 yards out, racing throuygh on goal and firing high past the keeper from 10 yards. With 10 minutes to go McLean was replaced by Jonathan McWilliams and the young striker wasted little time in making his mark; with only five minutes remaining he fired an unstoppable shot past the keeper to give Minerva a deserved 3-1 win and take them once more further in a knockout competition. Campsie Black Watch/Waterside drew 3-3 away to FC Clydebank in a Foster’s Central Scottish Division 1A encounter played on a very heavy surface after overnight rain. Both teams found it hard to get any fluency into their game because of the underfoot conditions but Campsie looked the likelier side to score early in the early stages. On the 15-minute mark Campsie were awarded a corner which was taken by Pettigrew to the back post to be met by the head on Wearing who blasted it into the net but the referee awarded a free-kick to Clydebank. Campsie were the attacking force and on 20 minutes Corr picked the ball up in midfield and delivered a great ball through to Aitken who beat the keeper to open the scoring. Clydebank had a free kick superbly saved by Campsie keeper McKluckie in the 22nd minute, but kept up the pressure and won a corner three minutes later which was swung into the Campsie box only to be netted by Cameron into his own net. On the half-hour mark Aitken returned the favour to Corr with a great pass which Corr blasted high into the net to put the visitors 2-1 up. But five minutes from the break a Clydebank corner was swung into the box and in the resulting mayhem the ball was netted by Fleming to bring the score level at half-time. The second half was more of a slog than the first as the park was beginning to cut up badly and was making the play scrappy. But Campsie were creating chances. First O’Connell had his shot saved, then Corr had a header just wide and a minute later Corr was on target only for the keeper to deny him. In the 70th minute Clydebank took the lead when Sillars, despite Campsie claims for offisde, burst clear to score. Campsie then had a man sent off with 12 minutes to play but to their credit were working hard and creating chances. And their efforts paid off when, with five minutes left, Corr hit a free-kick into the box for Aitken to score and end the game level 3-3. 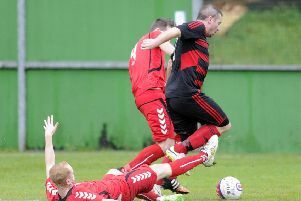 Harestanes went down 4-2 in their Premier Division clash at East Kilbride. The match started evenly enough with both sides driving towards each other in a fast, pacey fashion. The first chance fell to EK in the seventh minute, on target but Gill rose to grab confidently. Neither side was dominant at this stage, though EK were passing the ball around with greater accuracy than Harestanes. However Harestanes took the lead following some great play from Mackie. From deep in his own half he sped forward leaving a number of EK players in his wake. He laid off to Fitzsimmons who rolled the ball back to him. Mackie collected and stroked the ball past the outstretched hands of the keeper to nestle in at the far left. EK replied with an effort from inside the “D” but Gill was quick to turn the ball round the post. Harper came close to adding a second for Harestanes following hard work from Fitzsimmons, unfortunately his effort skimmed the outside of the post. EK themselves came close to scoring with a shot that rattled the upright before Fitzsimmons and Harper again linked up to produce the second for Harestanes. Again Fitzsimmons provided the assist with a lay-off to allow Harper to send the ball into the bottom right. EK pulled one back with a high ball crossed in from the left, their man got a head to it and despatch high into the net. Their equaliser was a carbon copy with another high ball in, the player again rose to head home. Harestanes almost retook the lead early in the second half. A fine shot from Mackie rebounded off the post, Harper was quickly on to it but failed to find the net. EK immediately hit back with an effort from just outside the right side of the box to enter far left. Their final goal came from a long ball that was collected and shot home. Harestanes’ Tote: no winner – £200 rollover. Foster’s Central Scottish AFL Premier Division - Haldane United v Campsie Minerva, Harestanes v Greenock HSFP. JB Tyres M & M Trophy Rd 1 - Arthurlie v Campsie Black Watch/Waterside. Turnbull High School’s under-18 Football Academy produced a fantastic performance to put themselves into the quarter-finals of the Scottish Cup. The players overcame a very strong, talented and well organised team from Stewart’s Melville College, beating their Edinburgh opponents 2-0. In what was a very tight affair with chances few and far between, Turnbull took the lead after 15 minutes through an acute volley from just outside the box by Dominic Savage. Turnbull very nearly doubled their lead on the half-time whistle as Call Connolly crashed a tremendous effort off the crossbar. At the beginning of the second half Stewart’s Melville took the game to their opponents and only some resolute defending and a great save from Adam Gallacher that kept the TFA in front. With the game still hanging in the balance with eight minutes to go, it was Christopher McKeown who sealed the tie. He was able to disposes the opposition right back, drive by him into the box and very calmly slot the ball past the keeper - a particularly enjoyable moment for Christopher who was making his comeback after a lengthy injury. Teacher Clare Grehan said: “Huge congratulations go to all our players who deserved their victory after producing an excellent performance from back to front. “As a very small high school it is even more admirable what these young players have achieved so far in the season. Turnbull squad: A Gallacher, J Holland, L McCall, K Hill (captain), C Healy, J Currie, C McBrearty, C Holland, D Savage, B Price, C Connolly, C Reilly, L Teevan, D Murphy, C McKeown, R Blair, R Glen, M Miller.